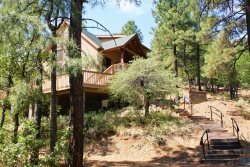 Pine Rock Cottage is a lovely property located just 3 miles or 9 minutes from downtown Prescott. Pine Rock Cottage is a lovely one level property nestled among the tall pines and beautiful boulders, located just 3 miles or 9 minutes from downtown Prescott. This 3 bedroom, 2 bath home sleeps up to 8 guests. The master bedroom has a new king bed with plush top mattress, flat-screen cable TV and opens out to the screened back porch. With soothing cool, greens and blues you will sleep soundly in these comfortable surroundings. The en suite bath has a double vanity, walk-in shower and a separate tub. There is a huge walk-in closet organized for your clothes and hiking gear. The second bedroom has a new queen bed, also with plush top mattress, large dresser and a closet with organizer. Bedroom number three has 2 new twin beds, another closet with organizer and a writing desk. The second bath is in the hallway with a tub/shower combination. All linens and towels are provided in this rental. Just bring food and clothes. The living room is beautiful and airy with large windows facing east and south, skylights and French doors leading to the screened in patio, and offers lots of comfortable seating. A large flat screen TV may be your second choice after previewing all of the interesting books on art and travel, as well as some timeless classics, and games this owner has provided. The couch is a new full size sleeper to sleep 2 additional guests… okay ALL of the furniture is new! Only 8 guests allowed though! It has a wood-burning stove to offer ambiance and warmth for cool winter evenings. The kitchen is modern and cheery with large windows and a skylight, two pantries and stainless steel appliances including a dishwasher. You will find all pots, pans and dishes for a simple snack or a gourmet meal. The kitchen island will be a gathering place to help cheer on the chef and to sample recipes as allowed. You may want to sit at the cute six top dinette in the kitchen, that can easily accommodate 8 with additional chairs provided… but I bet not! At Pine Rock Cottage you will be drawn to the outside which is really the nicest feature of this house. Plush green grass, tall whispering pines, enormous boulders and cool mountain breezes make this space hard to leave no matter what season you are in. The fenced back yard overlooks a ravine rich with wild life. Deer are grazing, hawks are calling, squirrels are climbing and javalina are roaming. Another four top seating area on the deck equipped with a propane grill is ready for your outdoor cooking and entertaining. The best seat in the house is a swinging love seat on the deck. We dare you to not spend hours here soaking in the sun or the afternoon shade. From your first cup of coffee in the morning until your last sip of wine in the evening you will wonder how you discovered this unique paradise! This accommodation also has a screened in back patio with a large six top table that could easily accommodate 8 with additional chairs provided. Endless hours of games and conversation will be spent here with Prescott’s fresh, clean mountain air. Internet, washer/dryer and central heat/cooling bring modern conveniences to this tall pine vacation home. The kitchen and bathrooms are tiled while the living room and bedrooms are carpeted and all rooms have overhead fans. A 2-car garage will keep your vehicle close and protected from the weather and opens right into the laundry/utility room. Please... no RV's, trailers or off-road vehicles.This cottage is quiet and calm. There is just one cabin further up the road so there is virtually no traffic. If you are looking for a dream vacation for a few days, a week or a month, Pine Rock Cottage is the place to be!